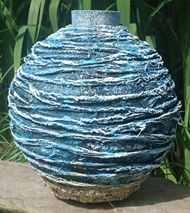 Earth Vessels are available in a variety of themes. Click on the images below to see all the designs in each category. 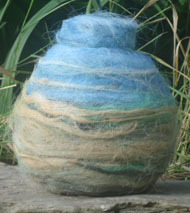 Earth Vessels are cremation urns constructed from many layers of hardened fabric and decorated with a variety of natural and other materials, earth pigments and colours and and firmly sealed with a coordinated cork lid. They are strong, lightweight and durable, and can be a beautiful display urn as a lasting memorial in the home. Earth Vessels feel like ceramic and are shatterproof though not waterproof, so Earth Vessels can also be buried in the ground where the fabric will biodegrade and the stone hardener will crumble away into the earth. Because they are not fired they have low carbon impact in their creation. Earth Vessels come in a variety of sizes and shapes - the size you choose will depend on whether you select an urn to hold all the ashes or keep a portion of the ashes in a smaller or keepsake urn. See the Purchase page for details of urn capacities and prices and the Frequently Asked Questions page to help guide your choice. The gallery shows the options that are possible in terms of surface. When you see a design you like, and you know the size and shape you want then either phone or email me to discuss your requirements (see the Contact page). If you want a different colour or embellishment, please ask. 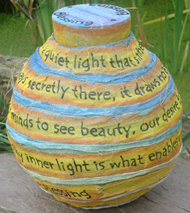 The inner surface of the urn can be any colour too. 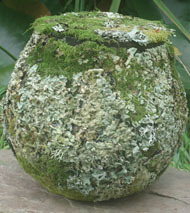 It is also possible to select a small or large lid style on most urns. You may like photos or a name put on the urn, or a favourite poem - whatever reflects for you what was special about your loved one. You may have ideas for your own bespoke design - most things are possible so please contact me with your ideas and questions to discuss what is possible. 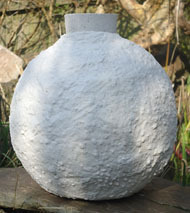 You can also purchase a Pure and Simple urn then use your own creativity to create the surface finish. 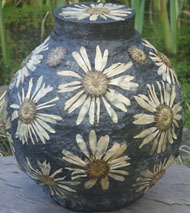 See the Pure and Simple urn page. As all Earth Vessels are handcrafted they will not have the regularity of a manufactured product. 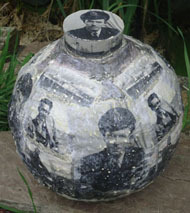 As each commissioned urn is unique there will be slight differences from the original photographed urn shown in the gallery. 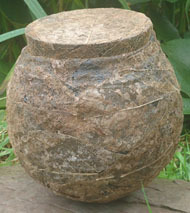 Some urns are decorated with natural materials which may fade or darken over time. If so, I have indicated this on the specific gallery pages.